This JOOLA Inside Table Tennis Table is approved by USA Table Tennis (USATT) for use in certain international tournaments. It can provide very good quality and is highly convenience. The table is designed with a 5/8″ wood composite for the table top. It has a resin apron with 1.5″ together with a powder-coated steel undercarriage for robustness and it managed to provide you with a very sturdy support. The construction of two table halves makes it possible to be used as a single table or two separate tables. This table is an ideal table for beginner. It is very sturdy and effortless for you to assemble. The table is come in two halves which allow you to move them for easy storage. The net clamp is holding the net firmly while you join the two tables. You can then start playing the game with your family members or friends and the table will stay in good condition with getting apart. However, one small drawback of the table is that it tends to get scratch easily. Hopefully Joola can take this into account and improve it for future table. Apart from this minor drawback, the table can said to be a great table with the price that offer. In order to set the table up, it will required of two people to assemble it up-right even though the assembly is rather easy for you to put up. Generally, you shouldn’t have any issue with the setup. If you place in your living room or basement with leveled floor, then nothing extra is needed for you to perform. If the floor is not leveled, you can adjust the levelers on the legs of the table to make the table stand sturdy. When you receive the table with delivery box when it is deliver to your house, you will find the table is very heavy as its weight total of 160 lbs. Many customer reviews show that they like this ping pong table due to the fact that it is effortless for them to assemble and they can start playing the game by just spend very little to setup the table. Normally it just takes you about 20 minutes to setup the table and you can start hold your ping pong paddle and serve the ball. The table may not built with top material or of best quality. Nonetheless, it undoubtedly can provide a more than decent playing surface for players to play the game of ping pong. It is especially an ideal table for people who love to play the game during their leisure moment but still wish to get a decent quality for their game play. Even though the table is not qualify for tournament play, but it still receive good demand from lot of amateur players who want to have a certain level of bounce and stability. While the JOOLA Inside Table Tennis Table is not qualified for tournament play, but the price that you pay for is much more cheaper than a tournament table. Thus, this is an ideal full size table tennis table for many people who are looking to play serious game during their leisure moment. This table is really awesome. While other ping pong tables can take 3-5 hours to assemble, this Joola inside only takes 30 minutes and actually my 13-year-old son is the one that put it together. That definitely make my life a lot easier. At first, I was worried and having concern about the quality of the table might be not very good, but I was wrong. It bounces like any ping pong table you would find at the arcade. This table can be fit to your family perfectly. 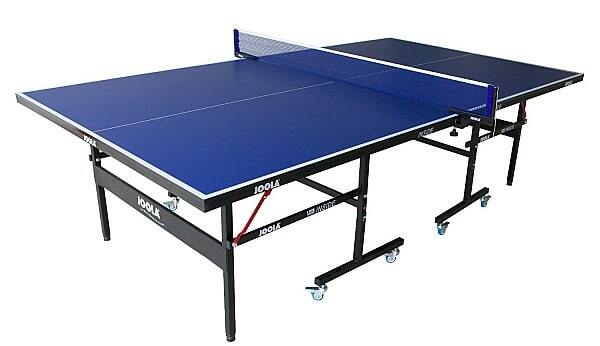 If you need a decent ping pong table that is relatively cheap, you may want to get this Joola Inside table tennis table. This Stiga Inside table is ideal for budget-minded families that would still wish to get a quality table with added safety. Each haif of the table was held up by a powerful undercarriage and is complete with automatic folding legs. Furthermore, the table is having adjustable height levels and 4 durable 2-inch casters. I personally love this feature very much and thats the reason that I bought this table in the first place.